As they negotiate with the pirates, the crew learns some uncomfortable truths about their hero, Admiral Pritchard, and that Trajan's plans may not stop at the destruction of the Resistance. Before long Jake and his team find themselves at the mercy of the most despised class in the Thousand Worlds: slavers. With the captain stranded on the dusty planet below, Commander Megan Po leads the Phoenix in one more deadly showdown with Admiral Trajan and comes face to face with her most dreaded nightmare: sending people under her charge to die. Awesome.. keeps the reader intrigued with all the different story lines and angles that all come together. Greg Tremblay does a great job with the narration and Nick Webb is a skilled author who does a good job with action sequences. But I found this book frustrating. I know that negative reviews usually aren't very popular but at least writing this review will serve as therapy for me after listening to this audiobook. This book (the second in the series) starts with the characters in tough spot. Then things get worse. Then they get even worse. About 90% of this book is a negative arc. A combination of diabolically clever enemies, treachery, and amazingly stupid and naive decisions by the main characters lead them into a deeper and deeper hole. Then the last 10% or so provides a breathless series of action sequences in which heroics and lucky coincidences save the main characters from apparently certain doom so that they can limp off and get into more trouble in the next book. As others have pointed out, there is a strong Battlestar Galactia vibe, overconfident fighter jock personalities (male and female) and various counterpoints forming most of the personal interaction. And there is treachery everywhere, with the main characters being amazingly blind to it until it is too late. I hoped that maybe the characters would learn something and that the third book would begin a positive arc toward a satisfying conclusion but it turned out to be more of the same - treachery, misunderstanding, and a continuing series of jumps from the frying pan into the fire. And the authors is apparently planning a long series instead of bringing the series to a close. The story picks up right where #1 The Terran Gambit left off. I really enjoyed The Terran Gambit, and I did this one as well. It's twice as long as the first book, though, but it's packed with story and action. This time the story takes place planet side as well, since things continues to go wrong for Captain Mercer and his crew. Characters are more fleshed out and there are several secondary plot lines in addition to the main one. Tremblay continues to do a great job with the narration. Distinct voices for each characters and he is able to bring the feeling of the characters out through his narration. Very well done. Recommended if you liked the first one. this story is a great book by a very talented author. it covers all the bases for a great space\war drama. and raises the book from very good to excellent. But you've got to notice, the Sci Fi space opera has come a long way! 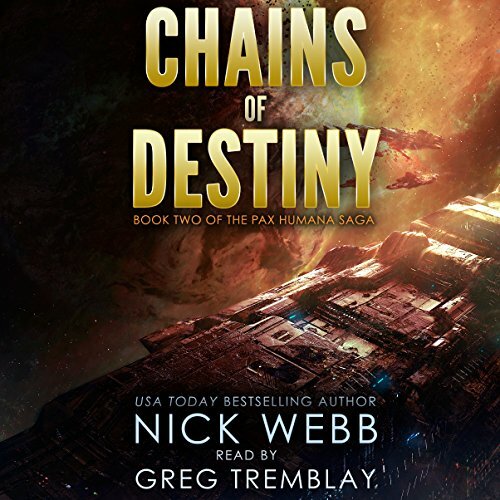 Would you consider the audio edition of Chains of Destiny to be better than the print version? This is such a great book and such a great read by Greg! I am in anxious anticipation for book 3!! Leaves sort of a lot of things unresolved and I must know what happens! Really a great series!!! The action, the pace, the characters. I really like Mercer, obviously, but he does wonderful on all the character's voices! Especially the insane, one eyed Imperial Admiral! YES!! Helped me get through some 12 hour overnight shifts! Awesome work by everyone involved, the author and Greg!